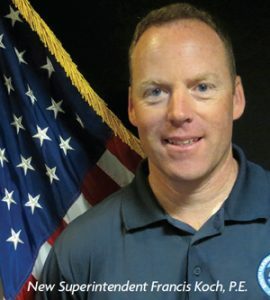 South Farmindale Water District is proud to announcement the appointment of Francis (Frank) Koch, P.E. as new superintendent of the water district. Frank arrives at SFWD with 23 years of experience from the Incorporated Village of Garden City. His first seven years there was as project engineer, followed by 16 years serving as Superintendent. Frank grew up in Malverne and earned his Bachelor’s in Engineering – Civil Engineering from Manhattan College. He moved to Westchester, NY for a brief period of time after college before returning to his neighborhood roots in Malverne. He’s lived there since and has been married to his wife Kelly for the last 10 years. Frank is also a former volunteer for the Malverne Fire Department and is an active member in his local community.